Alcoholics can be easily recognized due to their puffy face and bloodshot eyes. Their voice is hoarse and pulse rate is very rapid. They are prone to be irritable, suspicious and over-emotional. 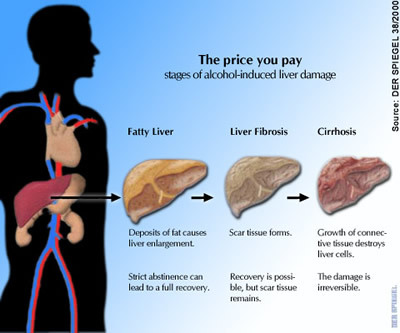 Alcoholics are likely to suffer symptoms such as bouts of vomiting, delirium, disturbed sleep and impaired judgment Alcoholics eventually land up with the disease called cirrhosis of liver where the liver is damaged due to heavy drinking. The bowel movement gets disturbed and other complications like, stomach disorder, weak and flaccid heart and damaged brain cells render the person unfit. 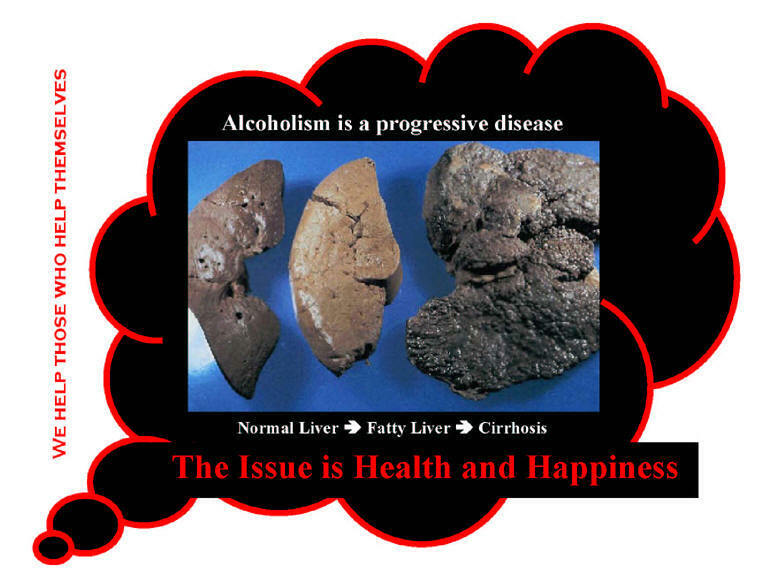 Alcoholics are likely to suffer symptoms such as bouts of vomiting, delirium, disturbed sleep and impaired judgment Alcoholics eventually land up with the disease called cirrhosis of liver where the liver is damaged due to heavy drinking. The bowel movement gets disturbed and other complications like, stomach disorder, weak and flaccid heart and damaged brain cells render the person unfit. 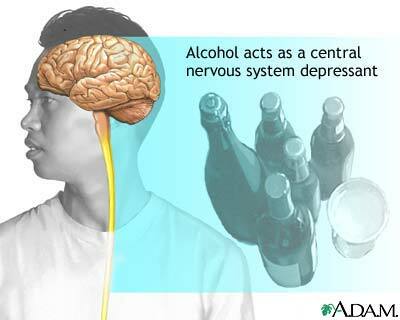 An occasional alcoholic drink is the starting point for alcoholism. Over a period of time, a person who drinks occasionally gets habituated and regular drinking becomes the norm. Quite a lot of people have to indulge in social drinking due to societal and group pressure, while others find an escape route through drinking to evade responsibilities. They are under the misconception that drinking is a form of stress relief. The restricted diet of grapes for about a month is a vital home remedy for alcoholism. As this fruit contains a very pure form of alcohol, it acts like a healthy alternative to alcohol. The ideal process is to take three meals a day of fresh grapes every five hours. 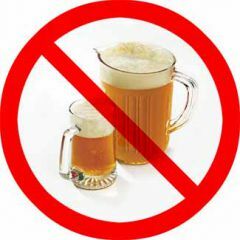 To make this treatment successful, the alcohol should develop strong will power to stop drinking. Apples when eaten regularly and liberally help in removing intoxication and reduce craving for wines or any other kind of liquor. Dates are beneficial in treating alcoholism. Rub together 3-4 dates in half a glass of water and have the alcoholic drink this two times a day for a period of about a month. Juice extracted from bitter gourd leaves is the perfect remedy for alcohol intoxication. It is basically useful for the damaged liver. Mix three teaspoons of the juice with a glass of butter milk and consume every morning for a month. The juice of raw celery creates a sobering effect on the alcoholic patient. In half a glass of water, an equal quantity of celery juice should be mixed and consumed once everyday for a month. This is a very successful home remedy to cure alcoholism. To prevent the patient from pining for stimulants like alcohol, it is most important to feed ample amounts of nutrients back in his body. To begin with, the patient should be on an “all liquid” diet, preferably juices, for a minimum period of 10 to 12 days. This is by far the best home remedy for alcoholism to start with. As this fast will progress, the patient will steadily experience less craving. This will break his drinking pattern and preferably the patient should start on a diet of several small meals a day rather than three large ones. The alcoholic needs to exercise regularly and include outdoor activities in his daily schedule. Even after the successful completion of the juice fast, the patient should continue to have an intake of fresh fruit juices and plenty of water. A healthy diet for alcoholism must include foods such as wholegrain cereals, legumes and pulses, fresh fruits and vegetables. Initially, the patient might experience cravings and so an appropriate replacement may be given to alleviate the same. A glass of fresh fruit juice and eating healthy snacks like candy or Soya beans etc will curb his cravings which might increase the urge for drinking in the stages immediately after the treatment. Avoid refined food products such as white flour, white sugar, white rice, macaroni products. This can be substituted with brown rice, brown sugar, leafy vegetables and other whole grain products. The alcoholic should be motivated to break the 'alcohol habit' through a strong determination to do so and by being consistent in maintaining his food habits. To try to give up alcoholism at once is almost impossible, so the alcoholic should make a firm decision to make a clean break out of the habit of drinking. Take a warm-water enema daily to rinse out the bowels during the first ten days of the 'juice fast’. Plenty of rest and outdoor physical activities and exercises are recommended. Avoid smoking as it increases the craving for alcohol.